1. Mass personalization as opposed to mass generalization is the future of the service industry. No two menus will be the same, each customer will see entirely different ordering options much the same way two users see different Google search results now. This applies to all customer facing applications... on mobile, at a self order kiosk in a physical store, or on the drive thru. 2. Software continues to eat the world. Algorithms replace repetitive human labor. What was once run entirely by labor intensive humans will not be digitized. The future looks something more like: Driver A's autonomous vehicle moves into McDonald’s drive through lane, a video monitor recognizes the car license plate or face of the driver. Software then quickly determines the personal preferences favor healthy options and there is only one occupant in the car. As the vehicle approaches the ordering screen, the menu will display salad options more prominently. 3. Buzzword BINGO will never die. Listen to the video above to hit your letters... 'intelligent menu boards' / 'data mining' / 'digital platform' / 'personalized experience' /... even Amazon got a name check! Below is the original article written by Marc Andreessen in 2011: "Why Software is Eating the World"
During Fed Chair Jay Powell's testimony this week, it was made clear that the Fed Chair is looking to walk back comments made in December 2018 that the balance sheet reduction was on 'autopilot'. This comes just months after Powell first made the ‘autopilot’ statement and equities responded with a torrid sell off, falling close to 20% before ultimately bottoming on Christmas Eve. This turn around can lead investors to a couple of conclusions. First, the FED clearly takes into consideration ‘financial conditions’ or more likely, equity valuation / stability. The FED put, initially thought lost during chair Powell’s first few months, is alive and well. Second, the financial sector and the economy as a whole are less able to absorb a tightening of monetary policy than previously thought. Throughout 2018, there was substantial discussion that the FED balance sheet runoff was going smoothly, that the economy was humming along, with some commenting that the global economy was expierencing ‘synchronized global growth’. 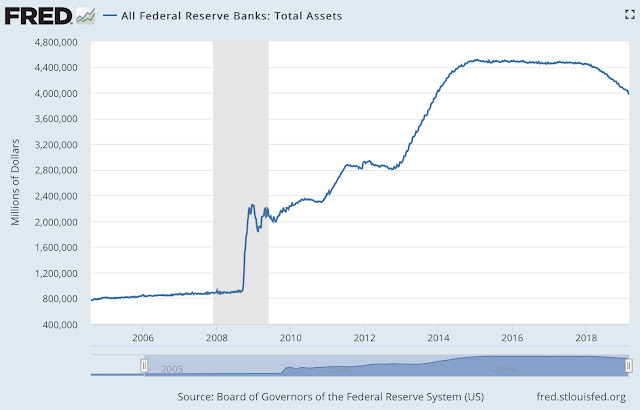 The below chart shows how far the FED has moved, after growing the balance sheet by over $3 Trillion, just ~$400B has rolled off. Relative to the increases, this was nothing and yet markets roiled up, volatility spiked, credit spreads were widening, and liquidity all of a sudden was being talked about as a risk. Economic growth may have even slowed as result, as businesses and consumers, concerned at the equity volatility, delayed spending / business investment in Q4. 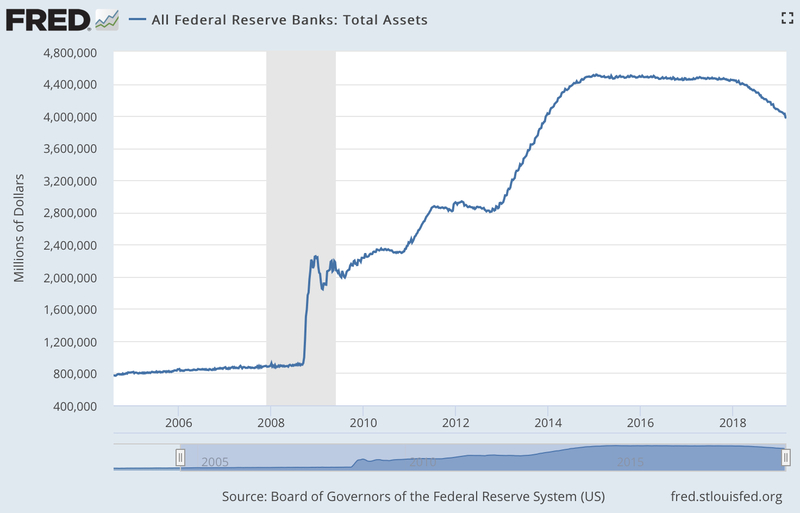 Now, the FED appears to have backed themselves into a corner on the balance sheet. The party’s back on, so let’s get up and keep dancing. The view of Manhattan from Roosevelt Island. Temperature, 5 degrees Fahrenheit. Montreal street photo after New Years Eve snow, 2016. I find this video fascinating every year.... Enjoy. Copyright © Chris Besserer. Simple theme. Theme images by kickers. Powered by Blogger.